As far back as I can remember, showing dairy cattle, and owning a herd of Holstein dairy cattle has been a dream of mine. Being born into a large dairy-owning family with six uncles and two aunts, all involved in the dairy business, and more than 25 cousins, all involved in showing – my involvement in showing was inevitable. As young as eight, I would help out in the show barn, washing my cousins’ animals, doing barn duty, and feeding and watering the cattle. I couldn’t wait until fourth grade when I would finally start my dairy showing journey. When I was in fourth grade, I was ecstatic when I got my first heifer, Chewy, from the Airoso 100th anniversary cattle sale. My dad bought her in partnership with another person, and I was so excited to show her. 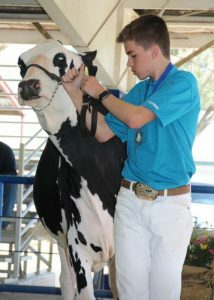 In my first fair, she got first place in her class, and I believed that when she became a cow, she would be awesome. But, unfortunately, she slipped her hip the following year. While she would live, and is still alive, I could no longer show her. This is the first lesson showing taught me which I would not forget over the next few years: showing is a high risk, high reward game. I would persevere getting new animals, and though Chewy has never had any heifer calves, she remains one of my favorite animals in my herd. I don’t have exactly the best luck when it comes to dairy showing. That’s what I’ve learned the most from showing. Some of my animals have had bad health, some genetically, some not, but almost all from uncontrollable circumstances. Several of my best show animals have died, but I remain showing, never having given up, always growing my herd, from one heifer in fourth grade, to about 10 animals today, despite my trials and tribulations. I have learned about genetics, and bulls, and what bulls are the best, among other lessons from this herd growth. Despite all of these negative lessons, by far the most important lesson I learned from showing is that it’s not all about winning. While certainly winning a show and getting Supreme Champion is fun, and I’ve done it myself, but the best part of the show is hanging out with your fellow 4-H or FFA members. I’ve learned that helping these friends out is the most satisfying feeling in the world. Two years ago, at the Western Classic Dairy Show in Hanford, a young showman’s animal came loose, and drug him around the ring. I stepped in and helped him get through it, comforting and helping him out. The next year, he came to me again, asking me to help him with his animal which acted crazy again. This was one of the greatest feelings; that someone looked up to me in something. It was through this experience, that I realized that dairy showing has truly changed my life.